The Number Ones: The Beatles' “Eight Days A Week” . Beatles Radio: The Beatles, Solos, Covers, Birthdays, News The Fab 4 and More! If the Beatles’ “I Feel Fine” was the first pop song to make artful use of feedback, their next #1 holds its own historical production distinction. 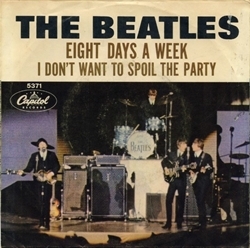 “Eight Days A Week” is the first song to open with a fade-in. Spending hours recording the song over and over, the band tried to figure out how to open it up. They settled on that sound: acoustic and electric guitars getting louder and louder, like the sound of a train approaching. They’re playing a riff together, one that sounds a bit like the one Rod Stewart would use on “Maggie May” years later, one that they abandoned as soon as the song kicks in. And maybe it’s too exciting, since the rest of the song never quite measures up.